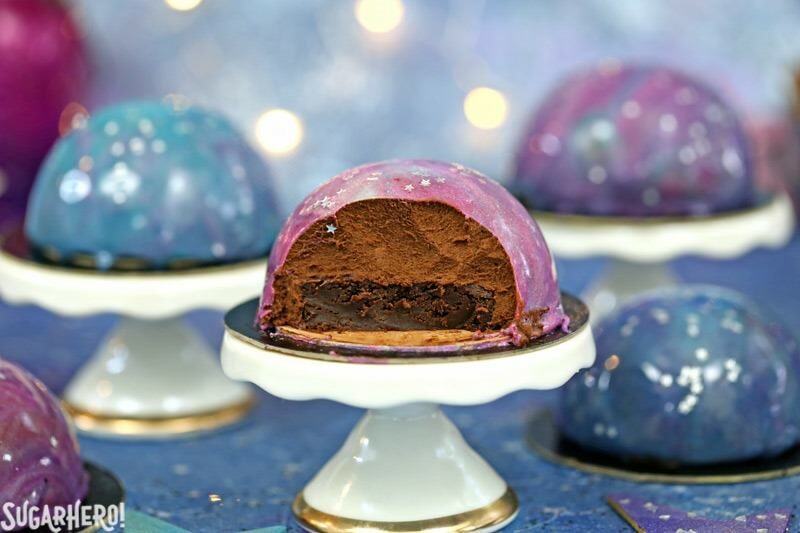 Galaxy Mousse Cakes are almost too pretty to be real! 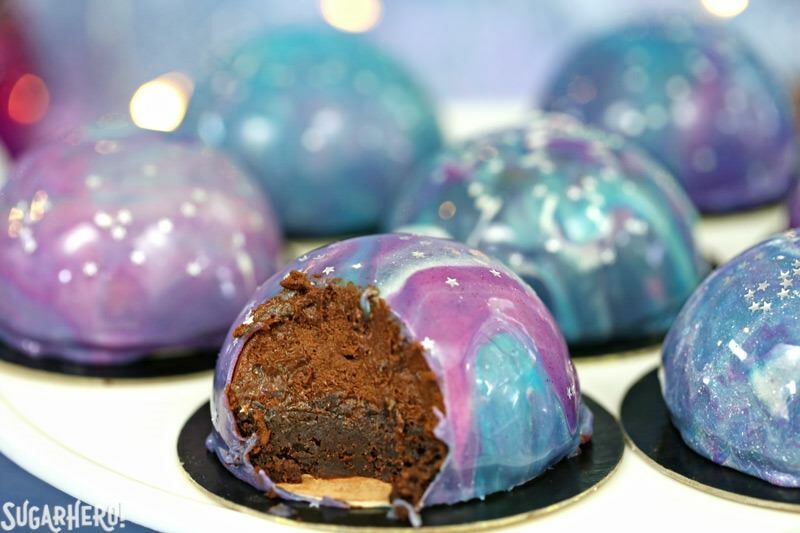 Mini chocolate mousse cakes on a brownie base are covered with a gorgeous glossy mirror glaze that’s swirled to look like the galaxy. They are delicious, edible works of art! If you’re not familiar with mirror glaze, it’s a white chocolate glaze made with gelatin that is poured over cakes—usually mousse or other soft molded desserts—to give them an ultra-shiny appearance, like the surface of a mirror. 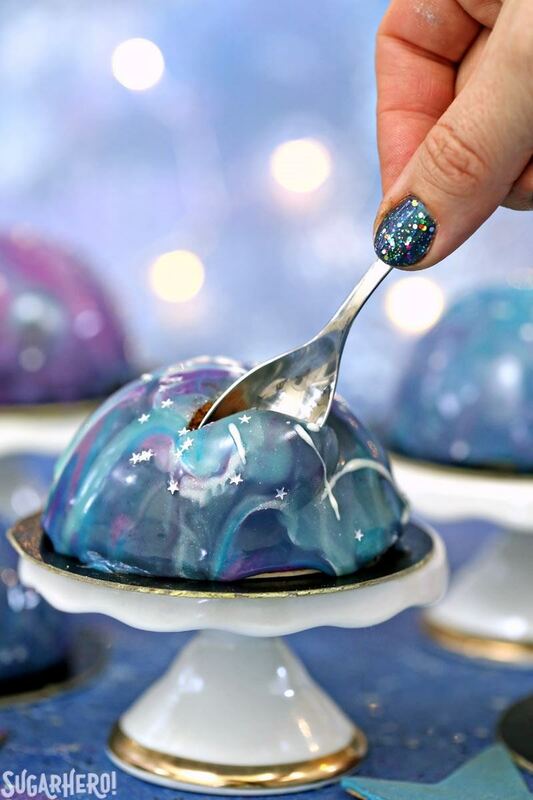 You can do SO many cool effects with mirror glazes just by adding different colors, pouring in patterns, or scraping the surface of the cake in different ways. You can create cracks, spiderwebs, tie-dye effects, and so much more. 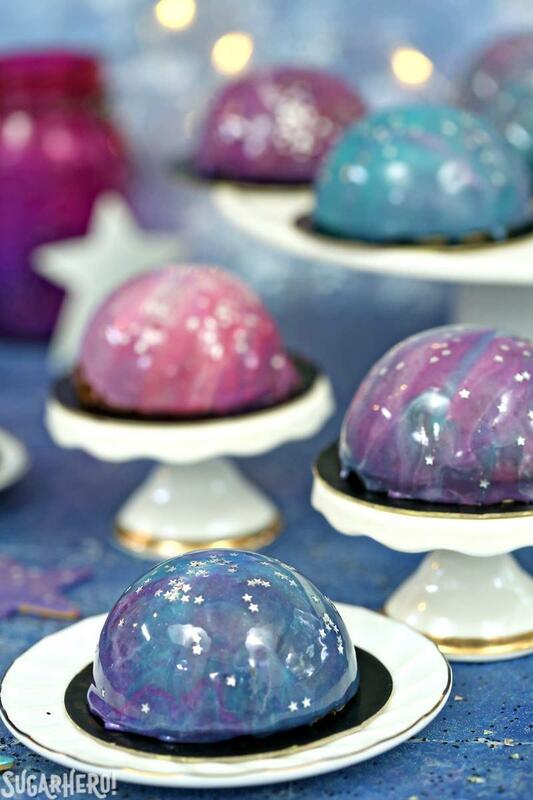 For my first go-round with mirror glaze, I decided to tackle a small subject: THE GALAXY. Here’s the bad news: this recipe has a lot of steps because there are 3 different components: the brownie base, the chocolate mousse, and the mirror glaze itself. You can skip the homemade brownies and go straight for a box mix, but it’s still going to be quite the time investment in the kitchen. Here’s the good news: the mirror glaze itself is simple to make, easy to pour and use (what a welcome surprise that was! ), and SO FREAKING COOL IN REAL LIFE. But I’m getting ahead of myself. First, the innards. The chocolate mousse is actually sort of a cheater’s version of mousse—no eggs are involved. Instead, it uses gelatin to give the mousse some stability, and I flavored it with International Delight Chocolate Caramel Creamer, which—might I say—I could just drink with a straw, I love it that much. I didn’t get too much of the caramel taste in the finished recipe, but it definitely boosted the chocolate flavor! I knew these would be intensely chocolatey, so I planned to make smaller, mini mousse cakes, both to control portions and for the cuteness factor. We thought these 3-inch spheres were the perfect serving size—enough to satisfy a big sweets craving, but not a ridiculous amount of mousse. And I love how the sphere shape makes them look even more space-themed! I used this silicone mold to shape the desserts. (You’ll need 2 to make the 10 cakes this recipe produces.) You don’t have to use this one, but I would be sure to pick a mold that’s deep enough to hold both mousse and brownie, smooth on the inside, so the top of the mousse won’t be textured and ruin the mirror effect, and large enough to produce a dessert that’s satisfying by itself. 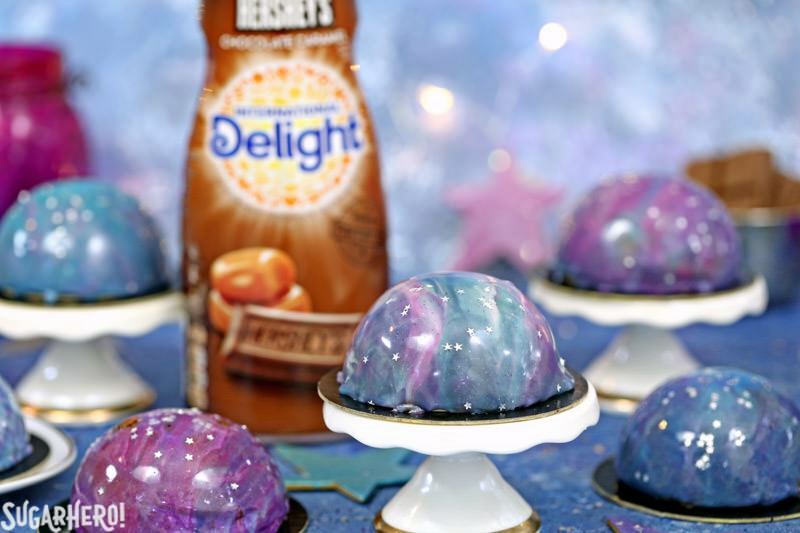 I don’t even know you, but I DO know you don’t have time to make a kazillion bite-sized galaxy mousse cakelets. Oh, and you DEFINITELY want silicone, as opposed to traditional pans. Being able to flex the mold inside-out to remove the mousse is a must! The mirror glaze seems intimidating. Believe me, I know. All those Instagram videos have been taunting me for the last year, but I had the fear in my belly. The fear that it would be a long project that would most likely leave my kitchen floors covered in sticky gelatin glaze. The last part was true (because I’m a klutz) but the first part is a lie. Mirror glaze is really not difficult! I hope the video up top will give you an idea of how simple it can be, but if you’re not convinced, I’m doing a Facebook Live THIS Sunday where we’ll make a mirror glaze cake. Follow the SugarHero facebook page and join in the fun! 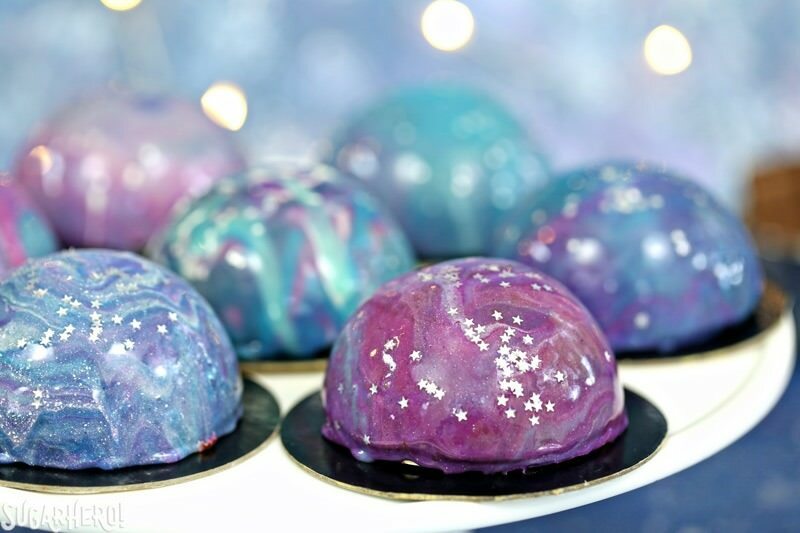 I went all-out with the galaxy theme, and decorated my mini mousse cakes with swirls of navy, teal, purple, pink, and white colors (which are probably way more colorful than the actual Milky Way, let’s be real.) I finished them off with a pinch of edible silver star sprinkles, and they looked like miniature works of art. Completely edible, totally delicious works of art. Galaxies aren’t your thing? You can do them all one color, swirl just 2 together, or go for a completely different color scheme than the one I chose. Use real white chocolate! I’m sorry, I know it’s much more expensive, but you REALLY don’t want to cheap out and use “white chips” for this one. The palm kernel oil or other substitute fats in the white chips just doesn’t behave the same as real cocoa butter. (It doesn’t taste as good, either!) 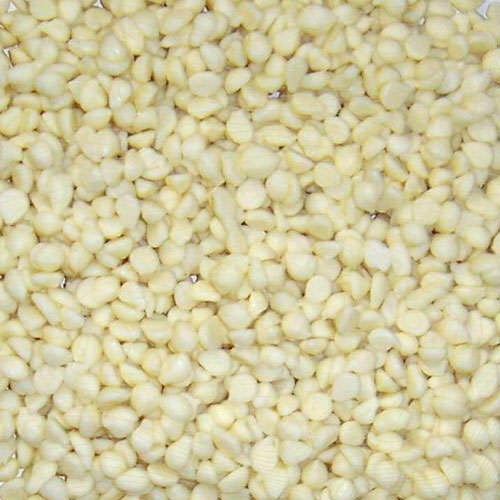 So you can look for white chocolate chips made with cocoa butter, or buy bars of real white chocolate and chop them up. COLD is the name of the game when it comes to molding the mousse. Give the cakes at least 2 hours in the freezer, but know that they might require more depending on your specific freezer. Well-frozen mousse will pop right out of the mold, and soft mousse with leave little bits clinging to the edges, and this rough texture is no good for the mirror glaze. After they’re unmolded, put them back in the freezer so they’re cold when you glaze them! A cold mousse cake is a happy mousse cake. Speaking of the glaze…be aware that the finished texture remains sticky (some say rubbery) and it’s unlike most other cake glazes you’ve probably tried. Some people love it, some people peel it off like fondant. And the taste? It just tastes like sweet white chocolate. Have fun! Be creative! Play with your food! 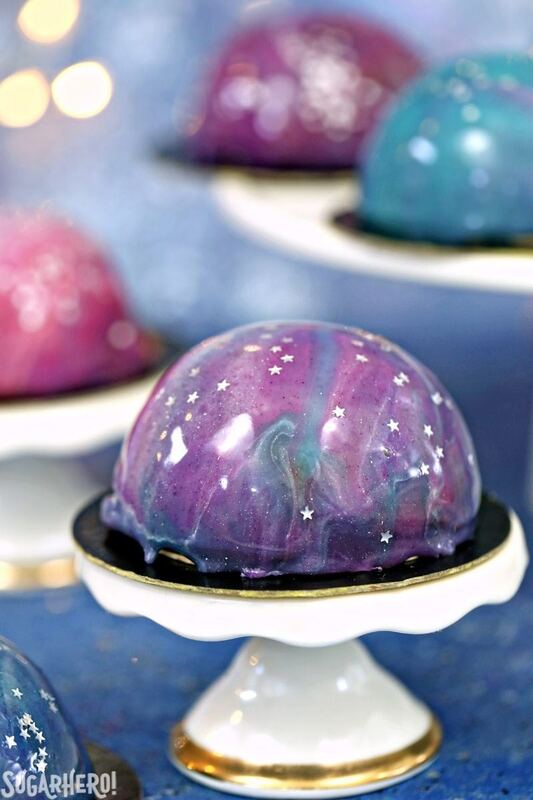 Galaxy Mousse Cakes are almost too pretty to be real! 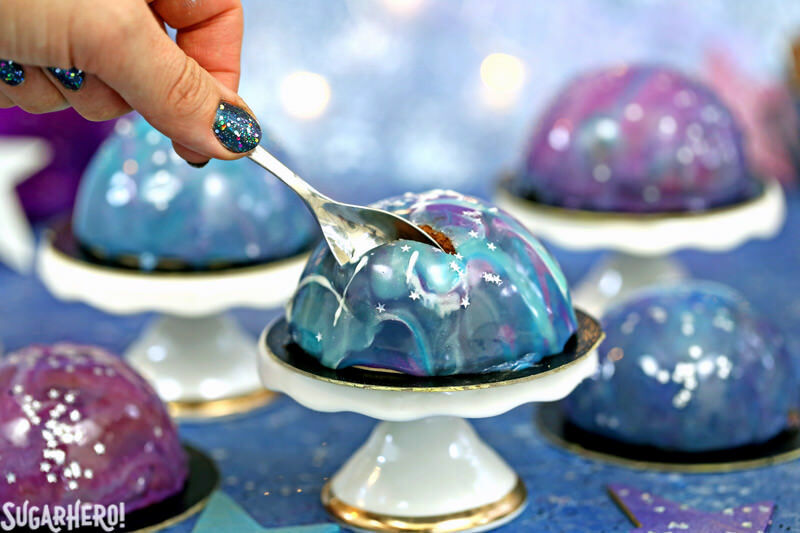 Mini chocolate mousse cakes on a brownie base are covered with a gorgeous glossy mirror glaze that’s swirled to look like the galaxy. Note that there are some lengthy chilling periods involved in this recipe, so although the time in-kitchen isn’t bad, you will want to make sure you give yourself enough time to prep everything. To save a few steps, you can use a box brownie mix instead of the homemade one provided. One final note: you’ll have some excess glaze, so consider saving it and using it on another dessert within a week or so! Line a 9” x 13” baking pan with foil, and spray the foil with nonstick cooking spray. Preheat the oven to 350 F.
Combine the butter and chopped semi-sweet chocolate in a large microwave-safe bowl. Melt them together in 30-second increments, stirring after every 30 seconds to prevent overheating. Once melted and smooth, let it cool to room temperature. Whisk in the eggs one at a time, then whisk in the instant espresso, vanilla, and granulated sugar. Continue to whisk until the texture smooths and thickens and the batter becomes glossy, like pudding. Finally, add the flour, baking powder, and salt, and stir in gently with a spatula until no streaks of flour remain. Scrape the batter into the prepared pan and smooth it into an even layer. Bake the brownies for 15 minutes, then remove the pan from the oven and gently rap it on the counter to release any air bubbles. Return it to the oven and bake for an additional 5 minutes (20 minutes of baking total), or until a toothpick inserted into the center comes out with just a few moist crumbs attached. Let the brownies cool completely, then use a 2 ¾” circular cutter to cut out 10 brownie circles. If the tops of the brownies are uneven, gently press down on them to flatten them out. Place the brownie circles on a covered baking sheet and freeze them until you’re ready to use them. Combine the chopped chocolate, International Delight creamer, and salt in a large microwave-safe bowl. 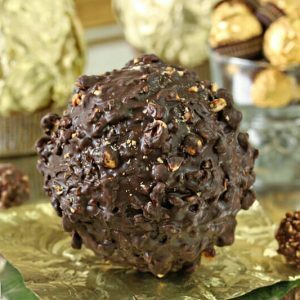 Microwave in 30-second increments, whisking every 30 seconds, until the chocolate has melted and the mixture is smooth. Let it cool until it’s slightly warm or room temperature, stirring occasionally. While you wait for the chocolate mixture to cool, prepare the gelatin. Whisk together the gelatin and the cold water in a small bowl, and set it aside to let the gelatin absorb the water. Whip the remaining 1 cup heavy cream to firm peaks, and set it aside for a moment. When the chocolate is at room temperature, it’s showtime! Microwave the bowl of gelatin for 10-12 seconds, until it is melted. Whisk the melted gelatin and chocolate mixture together. 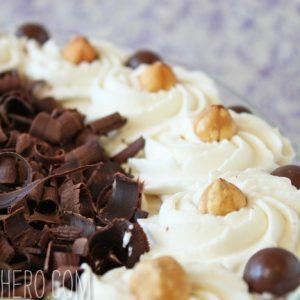 Fold half of the whipped cream into the chocolate, and once it’s incorporated, gently fold in the remaining whipped cream. Make sure your silicone molds are clean and dry. Use a large spoon to fill the half-sphere cavities, leaving about a half-inch of space at the top. Move the spoon around as you fill them to make sure the mousse is evenly distributed and there are no air pockets that will show up later. Take a frozen brownie round and press it on top of the mousse, pressing firmly so the mousse comes up around the sides of the brownie. Use a spatula to smooth around the edges so they’re perfectly clean. Once frozen, unmold and place each dessert on a small cardboard circle—this will make them easier to transfer later. Keep them in the freezer until you’re ready to glaze them. Whisk together the gelatin and 4 oz (1/2 cup) cold water in a bowl, and set it aside to let the gelatin absorb the water. Combine the remaining 5 oz water, sugar, and condensed milk in a medium saucepan, and place the pan over medium heat. Stir while the sugar dissolves, and bring the mixture to a simmer. Once it is simmering steadily, remove it from the heat and add the gelatin (no need to melt the gelatin first—just scrape the big blob out of the bowl!) Whisk the gelatin as the heat from the pan dissolves it, and whisk until it is almost entirely incorporated. A few small pieces of gelatin are fine. Add the white chocolate to the pan, and let it sit for a few minutes to soften the chocolate. If you have an immersion blender, that is best to use—just stick it right in the pan and blend until the chocolate is melted and the mixture is very smooth. If not, you can whisk everything together, just try to avoid vigorous whisking that will create a lot of air bubbles. Divide your glaze into as many bowls as you want. I find it’s easiest to have a few “base colors” that are larger portions, and a few “accent colors” that are smaller portions. I made 3 base colors, using Americolor Sky Blue, Royal Blue, and a mix of Royal Blue + a drop of Super Black. I made 3 accent colors using Americolor Electric Purple, Electric Pink, and Super White. All you need to do is whisk a few drops of food coloring into each bowl of glaze. Let the bowls set until they cool down to about 95 Fahrenheit (35 C). An instant-read thermometer is the easiest way to check this, but if you don’t have one, it should feel barely warm on your fingertip, and be thick enough to coat it. Stir the bowls occasionally as they cool, so they don’t form a skin on top. Take the mousse cakes from the freezer. Cover a baking sheet with parchment or waxed paper for easy clean-up, and set small jars or cups on the sheet for the mousse cakes to balance on—try to use ones that are smaller than the base of the cakes, so the glaze can drip down cleanly. In a new bowl, pour about 1/3 cup of one of your base colors of glaze, then drizzle the top of it with a few other colors—there’s no rhyme or reason here, so go crazy! After you’ve added all the colors you want, give it a brief stir to swirl everything together, but do NOT swirl too much and muddy the colors! Take this bowl of glaze and pour it over one of the cakes, swirling it around the top to make sure that all the sides are covered. Let the glaze drip down the cake onto the baking sheet. If it is dripping quickly and is a very thin layer, it’s too warm and needs to cool down a few more degrees. If it is gloopy and clinging to the cake and barely dripping, it is too cool. You can warm the bowls of glaze BRIEFLY in the microwave (start with 8-10 seconds each) and stir until they’re fluid again, and keep re-warming as necessary while glazing the cakes. Let the cakes sit for about 15 minutes, until the glaze is semi-set, then transfer them to small plates. Chill for an additional 10-15 minutes until the glaze is full set. I actually prefer to eat these when they’re closer to room temperature, so the brownie layer is softer, but that’s not everyone’s preference, so do what tastes best to you. Enjoy! If you cannot find the Chocolate Caramel creamer flavor, another flavor of International Delight creamer can be substituted. If you can’t find the creamer, you can use an equal amount of heavy cream or whipping cream instead. Where can I get the silicone mold? Hey Linda, I actually got them off of amazon. Here is the link https://amzn.to/2DbpdUj Thanks! Hello, I am from Holland so pardon my English. Do you have soms tips for me, I want to use agar agar instead off gelatine. I am making them for a children birthday party and not all children are allowed gelatine . Or maybe something else than agar agar, if hou have an idea. thank you. Hey Patricia, unfortunately I have never tried it instead of Gelatin so I wont have any tips however I would love to hear back on how it goes if you end trying it out. Thanks so much! Hey Tina, Yes that is exactly how to do it! It should work great. I would love to hear how it goes, and see pictures! Hey, we don’t have international demight creamer here in France. What can we use instead? Hey Caroline, You can use heavy cream or whipping cream. Either one should work great! Thanks so much, I would love to see pictures.